Although its easy to point at your Batmans, your Supermans, and your Spider-Mans as the most iconic superheroes of our age, it’s unlikely that we’d even be discussing them if it weren’t for the Fantastic Four. 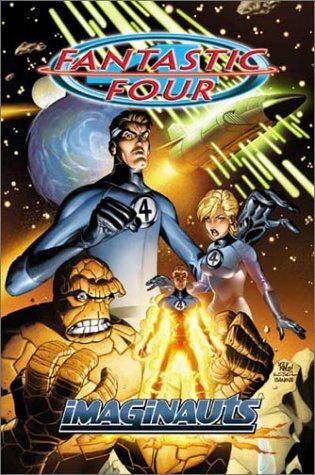 Fantastic Four #1 is where what we know of as Marvel Comics really began in 1961, and a strong case could be made that superhero comics as we know them wouldn’t exist without it. A family of four adventurers accidentally gets caught in cosmic rays while on a secret mission in space. They develop superpowers, and voila! The FF is born. When you’re a kid, reading superhero comics for the first time, that can come across as a pretty tame origin compared to those of vigilante Bat-creatures and snarling feral rodents. 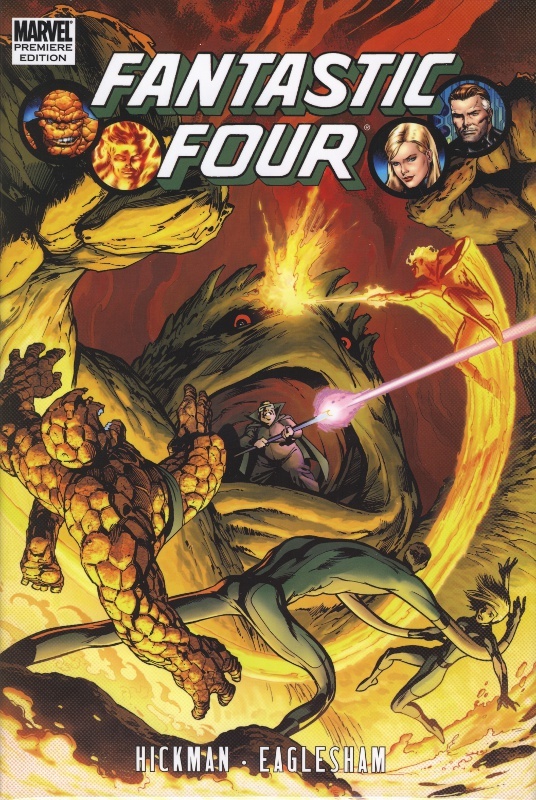 But my appreciation for the first family of comics has increased over the years, and it’s been somewhat of a surprise to discover how consistently good Fantastic Four comics have been. As has been the case with most of Marvel’s Essential collections, they don’t nearly do their source material justice. These oversized black and white editions collect the first several years of the FF’s adventures; Yep, it’s Stan and Jack. Stan Lee and Jack Kirby’s work on the Fantastic Four is one of the greatest achievements of modern comic art. That I am getting rid of these isn’t an insult to them, it’s a compliment. I’ll be replacing them with their high-gloss, Marvel Masterwork equivalents ASAP. Although Lee and Kirby’s work on the FF is considered sacrosanct, many fans would actually jump to the early ’80’s when asked to point out their favourite FF run. John Byrne took over both the writing and art in 1982, and redefined the concept for a new generation. How? By going back to basics. In fact, every single successful run of this title can be summed up in one phrase: Tight, close-knit family that loves each other unreservedly goes on crazy, science-oriented adventures. That’s it. When you try to complicate it, or go outside of those parameters, then you fail. Byrne understood this, and so while he did make changes, they were necessary societal tweaks, rather than a full-out overhaul. His stamp was mostly felt by the Invisible Woman character. He doesn’t get enough credit for it, but Byrne is the one who is responsible for transforming her from the vapid, blubbering, talking uterus as created by Stan Lee, into one of the most fully formed, realistic female characters in superhero comics. There were several notable moments in Byrne’s tenure on the title, but I don’t think he was stronger than on “The Trial Of Galactus”. Reed Richards had previously saved the life of one of the galaxy’s worst threats, and was now being held accountable by an intergalactic tribunal. To a 12-year-old kid, this was a jaw-dropping story, and one that doesn’t get enough credit. There are some flubs, mainly the marriage of Johnny Storm to Ben Grimm’s ex-girlfriend (easily fixed later on by the revelation that it was actually a shape-changing alien the whole time! Surprise! ), but all in all, this is one of the better continuous superhero runs that Marvel was responsible for in the ’80’s, and I think more than a few people would say that it was the greatest Fantastic Four run of all time. I’m a writer guy. I love writing, specifically good writing. And so, there aren’t many artists in the superhero world I like enough to make me pick up their books based on art alone. Art Adams is one of those, which is probably why I picked this up in the first place in the mid 90’s. 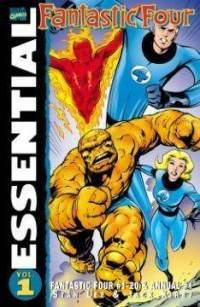 The Fantastic Four have been captured, and so an ad-hoc team of Marvel’s most popular heroes (Spider-Man, Wolverine, Ghost Rider, and the Hulk), team up to go after the bad guys. This was a fun story. It blends action and humour well, and Art Adams’ work jumps off the page into your brain, as usual. Walt Simonson wrote this one, and I enjoyed it enough on reread that I’m going to try to give the rest of his run a shot. As with Daredevil, my collection of FF stories has lots of holes it. For some reason I stayed away for most of the next 15 years after John Byrne left the book, until Mark Waid brought me back to comic’s first family. As with Byrne, Waid stuck to the basics, and focused on the FF as Marvel’s premier explorers, (or “Imaginauts” as Waid would have us believe). In my opinion, Mark Waid and Mike Wieringo’s run on FF really set the bar for what is still possible with fun, all-ages mainstream comics. Those who say that it’s impossible to just tell a good, old-fashioned superhero story anymore hasn’t read this run. Waid starts where are truly great superhero comics start; with the characters. He recognizes that these 4 people are comic archetypes by now, and so Waid doesn’t try to change their characters to match his stories; he changes his stories to match their characters. And so the stories, while fresh and action packed, still feel very familiar, and accessible. Waid’s writing here isn’t continuity heavy, it’s character heavy. Of course, any writer who tackles the FF eventually has to bring Doctor Doom into the mix. To Waid’s credit, he resists the urge for as long as possible, but then tells one of the most horrifying Doom stories of all time, one that focuses on Doom as a tortured, sociopathic villain, rather than as a two-dimensional punching bag. There’s so much to love here, but I’d be remiss in pointing out a few of my favourite moments: Reed telling his daughter the real reason why he went public with the Fantastic Four; Ben telling Franklin how hard it is for him just to get through every day; Johnny becoming the CFO of Fantastic Four Enterprises; Johnny and Sue switching powers, and many more. For superhero comics, it doesn’t get much better than this. While John Byrne’s time on the title might have been the most successful, and Jonathan Hickman’s current run might be the most critically acclaimed, it’s Waid’s that I’ll always go back to. 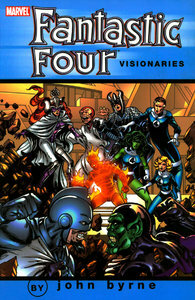 It’s my personal favourite Fantastic Four run, and one of my all-time favourite all-ages superhero comic. Or year, to be more accurate. Millar and Brian Hitch only did 15 issues of the Fantastic Four, but they definitely left a mark. As usual with Millar’s comics, this story was epic, ambitious, and ultimately disappointing. 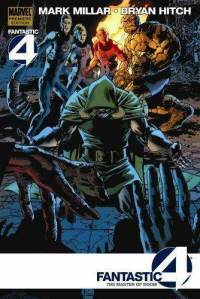 There were some big additions introduced (The “mentor” of Doctor Doom, the creation of an alternate Earth to eventually move all of Earth’s citizens to, etc), but the payoff was poor, especially with the Doom’s mentor storyline. This is the catch-22 of superhero comics: If you don’t add anything new, than people complain that your book is boring. If you DO add new concepts, then people complain that you’re monkeying around with time-tested classics. Millar decides to monkey, but doesn’t take enough time to really build up his new villains, or to develop subplots (Ben’s “marriage” comes to mind), that really should take years to pay off, not months. And so although he keeps telling us that they’re real threats, we don’t really believe him. These are fun stories though, and while I won’t say that they’re essential, they’re definitely worth a gander. So far he hasn’t quite managed to do that yet, but I like this aggressive version of Reed Richards so much I’m willing to keep giving Hickman a shot. So far, so good. This entry was posted in Comic Books and tagged Fantastic Four, Jack Kirby, John Byrne, Jonathan Hickman, Mark Millar, Mark Waid, Marvel, Mike Wieringo, Stan Lee. Bookmark the permalink.